What do you get when you cross the ancient practice of patronage with modern crowd funding? Short answer, Patreon! Patreon is a platform that connects artists with patreons, using an on-going patronage model. It is a really interesting to see a range of support options, and bonuses, depending on how the artist decides to set up their page. While Patreon is quite successful with visual and auditory media, it looks like it could be equally successful with written media. At least, if one can design nice snippets of writing to fit into an easily consumable form. I’m starting to explore this, relatively new, platform as a writer with novelette chapters as my medium of creativity. Now, normally I’m not jumping both-feet-first into a new idea. I love research, not spontaneity. But, Patreon seems to be different. It is basically a way to let people who love an artist’s work support them, so that they have more time and ability to make more of the work that those people enjoy. But, with a crowd funding twist, which really makes it more interesting. Now, I am just getting onto Patreon and figuring out how to set it all up. It’s not too complicated, but for me it’s a bit of a challenge. Me and cameras have trouble getting along sometimes. On a Patreon page, you have a video, an about, patronage levels, and funding goals and promises to achieve. The Video is the elevator pitch, who you are and what your page is about. My video took 5 re-takes before I managed not to trip too badly. And it’s still a touch longer than recommended, although that hopefully means I wasn’t talking too fast. Seriously though, every time I have to video something I’m reminded of why I like writing more – #1 no cameras! The About is a bit more depth than the video had. Preferably, it would be concise and to the point. However, since my “concise” video was 3 paragraphs, it’s natural that my about part would be a touch longer… okay, I’m a writer! I can be both concise and verbose at the same time. Oops! Patronage Levels are the heart of Patreon. These levels enable you to decide how much you want to support your select creative, and what bonuses you get in return. From a basic 1$ per month/chapter/podcast/blog post, with basic Patreon exclusives, to ultimate amounts that the patron chooses with epic bonuses (like print and signed book copies! ), the support on Patreon is doable by anyone. In my case, a basic Patreon pledge would be $1 per novelette chapter. With four chapters being published per month, the basic support costs the patron the equivalent of one large mocha per month. By the end of two months they get a whole novelette to read, in exchange for two large mochas. Funding Goals and Achievements, these are the icing on the Patreon cake. When certain funding levels are achieved, the artist promises to make changes. This can include their website going ad network free, getting audio books created, or getting professional cover design done. What do you think of the Patreon concept? 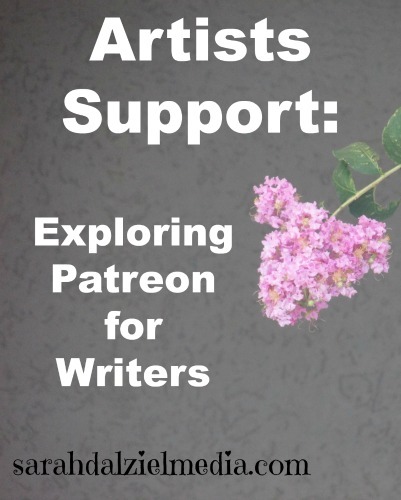 Would you support an artist on Patreon? Leave a comment, I enjoy hearing from you!